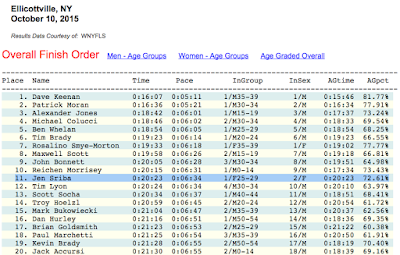 Important question – Does a 5k PR count if they spell your name wrong in the results? 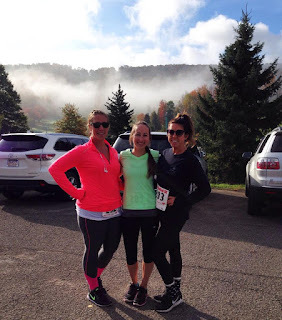 I spend the long holiday weekend in Ellicottville, New York for Fall Fest with my family. It was a fun-filled weekend of activities including a 5k on Saturday morning. (Signing up for the 5k wasn’t even my idea!) I went with my two cousins Melissa and Michele and friends Ali (remember Ali from the 50 Yard Finish?!) and Michele’s friend Katie. Side note: I am such a proud cousin right now. Melissa is in the middle of a 6-week 20 pound challenge and is doing SO GOOD! She looks great and is totally changing her whole lifestyle. 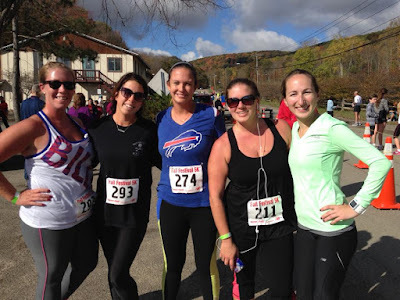 Michele is also doing big things as she signed up for the half marathon in Houston. She recently started running and seems to really be getting into it. (I drew up a 14-week training plan for her that starts TODAY!) Last week Michele ran 7.5 miles while Melissa biked alongside her. Love the motivation and teamwork, girls! The race was small with only 196 finishers and started/finished at Holiday Valley Ski Resort. It was an out and back course with the first half mile downhill and the last half mile uphill. So fun! NOT! 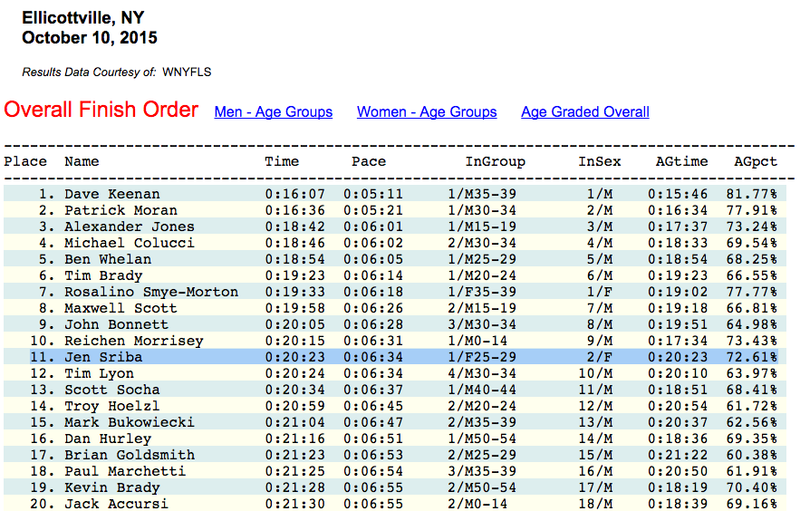 I believe the race website used the word “epic” or “thrilling” to describe it. It didn’t look that big but it felt ginormous. The rest of the course was flat. Kind of boring but the mountains and fall foliage was GORGEOUS! Before the race it was super foggy and cool but just as the gun was about to go off, the fog broke and the sun came out making the scenery even prettier. Overall, I felt really good running. I wasn’t trying to PR. I wasn’t trying to place. All I wanted to do was run “comfortably fast.” (My Tuesday morning spinners always make fun of me for using that term but it totally makes sense to me!!) I cruised through the first mile, settled into a rhythm during the second mile, slowed down a bit from 2 to 2.5 miles then powered up the hill to a 20:23. YEAH! Up next: Cape Cod Half in 2 weeks! It sounds like a wonderful event!! I have never attended such event but I would love to! Anyway, currently I am doing arrangements for my Christmas holiday party and can’t find any good outdoor venue for that. It would be great if anyone could suggest any venues! !